Please join us on February 26 at Trinidad Rec Center! This month DDOE will join us to tell us more about the RiverSmart Homes program, Neighbors United for DC Statehood will share their updates and let statehood supporters know how they can get involved, and we’ll learn about racoons and other urban wildlife. We’ll also have updates from neighborhood ANCs and MPD-5D. As always, we’d love to hear your community announcements! 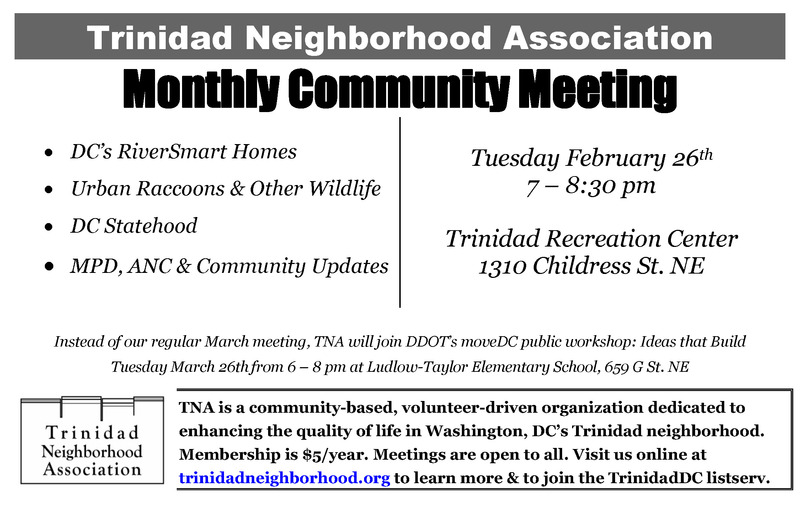 Join the Trinidad Neighborhood Association for just $5 per year! Become a member for just $5 a year!